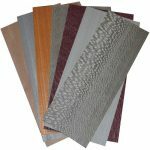 Get plenty of variety with our wood veneer packages. There are several reasons why wood veneer packages could be the best option for the woodworking projects you do at your Los Angeles, California home or business. The first is that you do quite a few projects throughout the year and want to control costs to improve your profit margin. Another is having a variety of products in hand to aid you in the design and inspiration phase of your projects. Whether you are looking for a hobby pack, variety pack or need information on custom wood veneer packages, give us a call at Sauers & Company Veneers. We have been a trusted leading veneer supplier for more than 50 years with veneers created right here in the United States using both domestic and exotic woods. We have supplied some of the leading furniture manufacturers over the years, so putting together even a large, bulk order is within the realm of our capabilities. We are second to none in terms of variety with more than 125 wood species and six different backing options. With natural and dyed wood veneer products to choose from, getting a unique result for your project is easy. Our customer service is also unrivaled, so feel free to contact us if you need something different. We’ll go out of our way to locate what you are looking for and get it shipped to you as soon as possible. If you have any questions about our wood veneer packages, including what is in them and whether to go with a standard or custom package, don’t hesitate to contact us.